James Devlin was the eldest son of Daniel and Catherine Devlin. James was born in Drumglass, Dungannon about 1891. His father was a labourer. The family lived at Railway View, Dungannon. James’ father Daniel died about October 1907. By 1911 he was working as a Hackle Setter. James Devlin enlisted around October 1913. Private Devlin left for France with the first Expeditionary Force on the 8th August. Private James Devlin was serving with the 2nd Battalion of the Royal Inniskilling Fusiliers when he was wounded on 21st October during the operations in front of Ypres. 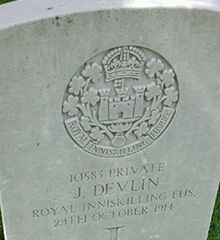 Private Devlin died in hospital in France of wounds on 29 October 1914. He was 24 years old. Armentières is a town in the Department of the Nord, on the Belgian frontier, 14.5 kilometres north-west of Lille. From the town of Armentières take the D945 to Estaires. Cite Bonjean Military Cemetery is signposted off this road just before Erquinghem-sur-la-Lys.